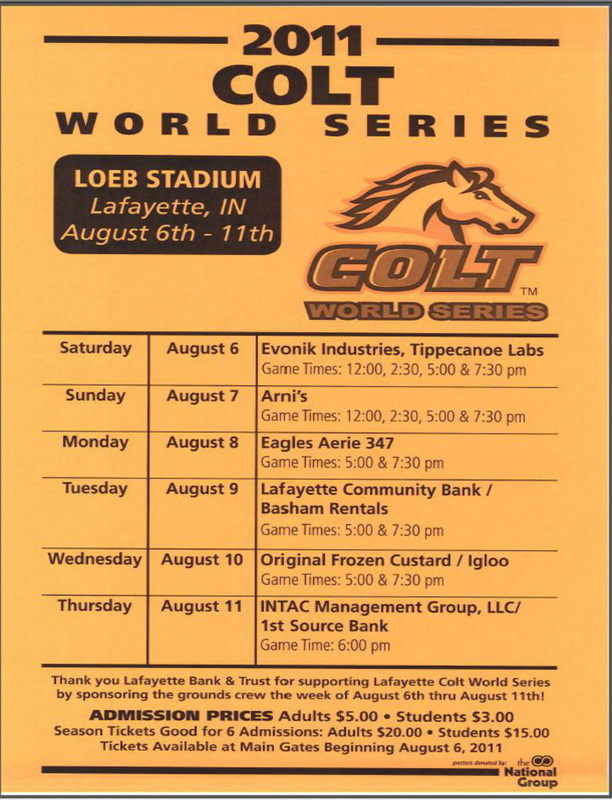 Game Schedule for the 2011 Colt World Series at Loeb Stadium in Lafayette, Indiana, August 6th through 11th (click for full sized image). 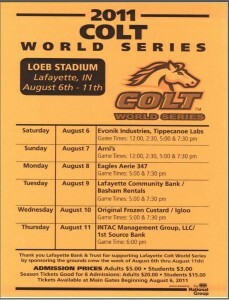 Loeb Stadium is located at 1915 Scott Street in Lafayette IN 47904 on the corner of Wallace Avenue and Main Street. Parking is available on the streets surrounding the ballpark or the parking lot on Scott Street. From I-65: Take Exit 172 (Lafayette/Rossville SR26). Head west on SR26 (South Street). Turn left on Park Avenue. Veer right onto Wallace Avenue. Loeb Stadium will be on your right. From Downtown Lafayette: Take South Street east (away from river). Turn right onto Main Street. Loeb Stadium will be up a few blocks on your left. Mmmm! I don’t see where the results of the Colt Championship game is. Where would I find it? No published results – could it be that your home team didn’t win?